Want a free chance to win every day? Experience the thrill of hitting the slots while enjoying fantastic rewards with Ninja Casino’s free spins and daily bonuses. With amazing offers available every single day, there are always opportunities to receive bonuses on our most popular slot machines – all with no registration required. On mobile or desktop, you can play online wherever you are – bringing the buzz and bright lights of a Las Vegas casino to you. Whether it’s on the move or on your sofa, you can enjoy hundreds of free spins on us – all you need to do is make a deposit. As part of our treasure chests, enter a minimum qualifying amount of money to get free spins every day – and the number of spins you can qualify for goes up from there. Every 24 hours you can claim free spins – and at Ninja Casino, we set a competitive wagering requirement of x45, with leaderboards so you can play to win great prizes too. A free spins bonus is a reward given to Ninja Casino customers as a ‘thank you’ for making a deposit. In other casinos, players get a bonus for registering. But at Ninja Casino, we don’t ask our players to fill out a time-consuming registration form and share unnecessary personal details. We give them free spin bonuses every day they make a deposit. Players receive a certain number of free spins on selected slot machines, depending on the amount they deposit. The profits made on those free spins are theirs to keep and use on the slot games available in the offer. In most online casinos, you need to go through a long process to access your free spins bonus, such as filling in a long registration form, verifying your age via a credit card or scanned documentation, or providing your email. Ninja Casino is different. Our registration is free, and you don’t need an account with us to claim your free spins. It’s as simple as that. Find out more about Ninja Casino’s revolutionary payment processes here. Our Ninja Casino free spins daily bonus is one of the best bonus offers you’ll find online. 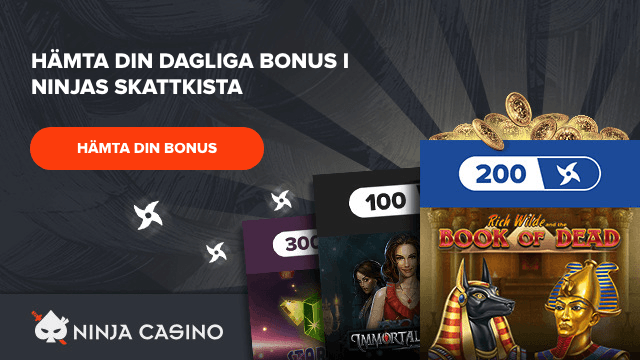 Our unique non-registration bonus appears when you deposit a minimum of €20. You’ll then receive up to 75 free spins on us. This deposit needs to be made in a single amount, as multiple smaller deposits won’t activate the daily free spins bonus, even if they add up to that amount. Receive 175 additional spins by depositing a minimum of €50 the following day through our simple BankID transactions. That’s 250 spins in total you can earn, just by making two separate deposits over two days. Your free spins are valid for 24 hours from the time you make your initial deposit. Best of all, your bonuses are automated so you won’t have to input a bonus code or register to access. They’ll be waiting for you even if you pause your play or close your browser, so you won’t ever lose them. Wagering is a gaming concept related to free bonuses. It basically determines what a player has to do in order to take home their winnings, known as a wagering requirement. At Ninja Casino, we offer a wagering requirement of x45. This means you must stake a total of 45 times your original bonus before you can claim the winnings. For example, if you received a bonus of €10 with a wagering requirement of x45, you would need to stake a total of €450 before you can cash out your funds. This can be done over a number of games – it doesn’t have to be a single stake. The higher the wagering requirement, the more you need to bet in total before cashing out. Our requirement is one of the most competitive in the online casino industry, with some casinos setting their levels as high as x90. We set ours at half that amount. Before playing, view our terms and conditions so you’re aware of all our rules related to bonus systems. Leaderboards are tables that rank different players on a variety of games, including blackjack, poker and slots. Players are ranked by the money they win – usually over a pre-determined time-period – with their name, rank, score and winnings displayed on a leaderboard for other players to see. Players who finish in one of the top positions receive prizes, ranging from money to bonuses. The top positions vary depending on the game or promotion. At Ninja Casino, we regularly run promotions where you get the chance to earn fantastic rewards when you wager a minimum amount on selected games as part of the promotion. In our Hunt of the Shogun slot machine promotion, for example, participants received points for wagering at least €0.50 per spin. Players are ranked on the money they win, with the top 100 players at the end of the competition receiving the choice of a cool €10,000 or 10,000 free spins as a reward for their fantastic play. How do bonus offers work? Bonuses are activated when a player deposits cash, known as a deposit bonus. Every online casino requires a minimum amount to be deposited to access a bonus. Their size depends on how much money is deposited and how much the casino is willing to add to that bonus. They vary from matching bonuses of 100% of your deposit, to others like the Ninja Casino, where we offer free spins bonuses, daily. The player has to use their own funds to play, but has the chance to gain more using the extra cash, or free turns they’ve received from the casino by depositing. Our daily free spins bonus can be used on some of our most popular slot games. We change these slots all the time, adding new and exciting games. Check out our game updates in our blog to see what slots are available. Explore the huge selection of slots we have on offer and start playing with your free spins bonus today.